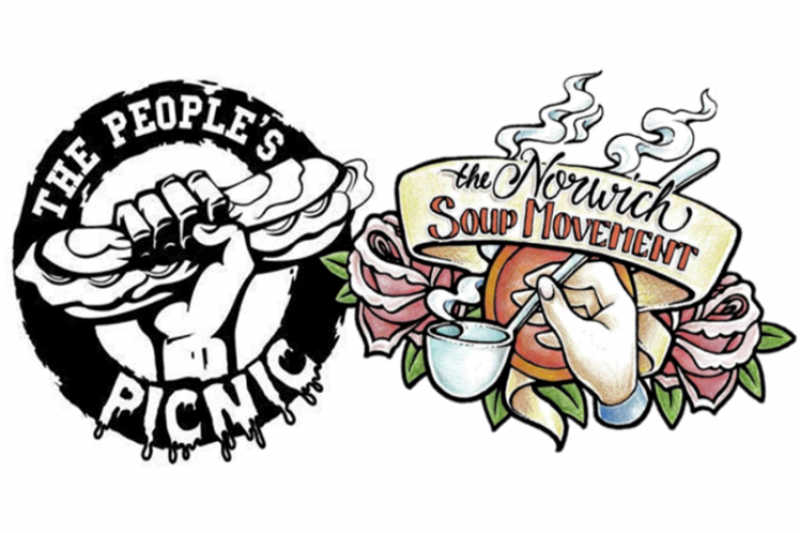 The Norwich Soup Movement and The People's Picnic are two DIY, not-for-profit organizations, set up a few years back with the same aim; we are on-street soup kitchens, providing hot meals, drinks, clothing and support to the homeless and hungry of Norwich. We do this five nights a week, with help from a band of amazingly comitted volunteers. We are entirely publicly funded and we have got this far with the generosity of the people of Norwich. We are now coming to the stage where we are thinking much further down the line. Having to leave and go home after a soup run, knowing that we may have done a great job to feed people, but that the harsh reality is that they will still be out on the streets while we're getting into our warm beds, is one of the hardest things about running this project. The next step is to take the kindness and generosity of the people of Norwich, and turn our soup kitchens into something much bigger. We want to create a place that the homeless can come to, a safe place, a place where people have the chance for a second chance. A base to settle in, without fear of being moved on. A home, if you like. We would like to have an on site kitchen and canteen, meaning no more serving on the streets. People can eat at tables in the warmth with their friends. We plan to open a pay as you feel café and charity shop, also on site, where people can start getting back into work, and earn a wage, so they can start learning to support themselves again. We also want to have music and art rooms, where volunteers will teach people new skills or help to bring out confidence as people start to remember the person they were before they became homeless. We would like to offer rooms to people, to give them back their independence, while at the same time offering a wide range of support to help them on their journey back into employment and finding a home outside of the hostel. There would be no set time limit for people to 'recover', but each person would assisted in a way that suits their individual needs, to help get their lives back on track, and not with a blanket programme to cover all cases. We would link in with other services around Norwich to assist with substance misuse, mental health and criminal issues, ensuring all bases are covered and people are 100% supported from all angles. The primary issues we are addressing are homelessness, social isolation and poverty, in which all three have seen a sharp rise in recent years. We personally have encountered many vulnerable people on the streets requiring immediate shelter and support, ranging from pregnant females, those suffering from mental health issues, disabled, elderly members of society, and many more experiencing impoverishment and a myriad of other issues. At the moment we distribute food and other essentials to 40+ people five nights a week from the street, however there is a critical need for a premises so we can provide food, shelter and additional services such as mental health support, drug/addiction advice, all under one roof in a place where people feel safe, recognised and valued. People are desperate for an alternative to the current services available which are often restrictive in who they accommodate, and there is a great and documented need for this in Norwich. Although we only started out as a small group of concerned citizens, we have now grown into a collective group harbouring over 400 individual volunteers and are supported by a range of local businesses all willing to contribute time and effort to make this a success. It is our priority to find a suitable building as soon as possible and ideally this will be operational and accessible to those in need before the harsh realities of winter set in. With 1 in 5 people are now living in poverty, a 50% rise in homelessness and cuts to vital services, the need is now greater than ever. We’ll be helping homelessness, unemployed and struggling families with access to food and other necessities, providing drug/addiction advice, mental health support, assistance with benefit claims/CV’s, and also providing workshops to teach new skills that will aid people in finding work. This will not only impact individual self-esteem but hopefully improve employment chances. In addition we are trying to reduce the amount of household food waste by the re-distribution of unwanted food before it reaches the bin and ultimately landfill sites by creating meals from donated ingredients that would otherwise be thrown away. In addition we are trying to reduce the amount of household food waste by the re-distribution of unwanted food before it reaches the bin and ultimately landfill sites by creating meals from donated ingredients that would otherwise be thrown away. The café will reduce the amount of household and retail food waste through the re-distribution of food before it reaches the bin and ultimately landfill sites, by creating meals from donated ingredients that would otherwise be thrown away. This will also create an environment where people can work in the kitchens or serving food to earn a wage as an alternative to begging. By providing opportunities for people to access affordable food as well as a chance to earn money it will hopefully aid in reducing poverty linked crime, people turning to alternative methods to make money or worse potentially starving, the impact of this will benefit the whole community. Thank you to anyone that is able to donate to us to help us reach our target, it really will make all the difference.